Taiwan-based PlayNitride was established in June 2014 to research and develop Nitride related materials and applications. The fabless company is now focusing on GaN based MicroLEDs - it is branding its technology as PixelLED displays. PlayNitride has two main technologies - its mass transfer process and its SMAR.Tech pixel repair technology. According to reports PlayNitride started to sample micro-LED at the end of 2017, with first displays expected on the market by 2019. The company says it can reach a pixel density of 1,500 PPI. In April 2017 it was reported that Samsung Display is set to acquire PlayNitride but this is not official yet. In May 2018 PlayNitride demonstrated its first Micro-LED prototypes, as the company plans to setup a NT$500 million (US$17 million) production facility at Hsinchu Science Park. According to a new report from Taiwan, Samsung Electronics is planning to release a 75" consumer Micro-LED TV in 2019, using LED chips and technologies from Taiwan's PlayNitride. Samsung will also invest further in PlayNitride to help it increase its production capacity (Samsung's stake in PlayNitride will reach 30% following this investment). In July 2018 Samsung Electronics video and display chief, Han Jong-hee, said that Samsung aims to release a Micro-LED consumer TV next year - The Wall Luxury that will be based on its Wall modular TV. It could be that this will be the 75" TV that will use PLayNitride's chips. PlayNitride to launch its first Micro-LED display products in 2019? LEDs Inside reports that PlayNitride aims to release its first Micro-LED display products in 2019. In 2017 the company started to sample micro-LED panels and shipped samples to 10-20 potential customers. The company's chairman and CEO, Charles Li, said in June 2018 that 5-6 of these customers are continuing the developing of micro-LED modules based on these panels. In May 2018 PlayNitride demonstrates two Micro-LED prototypes - a small 0.89" 64x64 (105 PPI) panel with a brightness of 800 nits and a larger 3.12" 256x256 (116 PPI) panel. Taiwan's PlayNitride demonstrates two Micro-LED prototypes at SID 2018. The first one is a small 0.89" 64x64 (105 PPI) panel with a brightness of 800 nits. 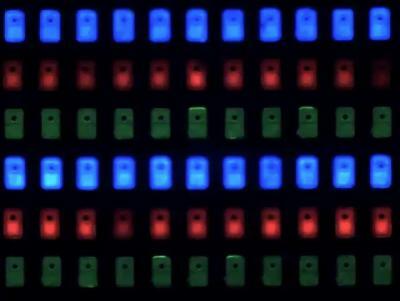 All of the LED chips in this display were transferred in three shots (one shot per color). The pixel size in this display is 0.243 mm. The second display is a larger panel - 3.12" 256x256 (116 PPI). Due to the larger number of LEDs (total of 786K LEDs) PlayNitride had to use 24 shots to transfer all three colored chips. The pixel size in this larger display is 0.219 mm. The world's leading display conference, SID DisplayWeek, is now over, and it was a very exciting event. This is just a quick first impression post - you can expect several MicroLED-Info articles in the next couple of weeks after we get back to the office and sort through all the materials, interviews, photos and videos we have. DisplayWeek is all about display technologies - and it seems that this year Micro-LED technologies and displays were all over the place. We've seen many Micro-LED demonstrations, prototypes and technical discussions. Of course LCDs and OLEDs are still the dominant technologies, but it seems many companies are investing in Micro-LED R&D as it is a promising next-generation display technology. Digitimes reports that Taiwan's Ministry of Science and Technology approved PlayNitride's application to setup a NT$500 million (US$17 million) production facility at Hsinchu Science Park. PlayNitride aims to produce micro LEDs, display modules and panels at its new facility at Hsinchu. According to Digitimes, Apple is in preliminary talks with PlayNitride towards a possible Micro-LED technology cooperation. PlayNitride began sampling micro-LED panels, shipping these to 10-20 potential customers in Q4 2017. The company's chairman and CEO, Charles Li, says that 5-6 of these customers are continuing the developing of micro-LED modules based on these panels. In September 2017 we reported that Charles Li said that Micro-LED displays are not as challenging as originally expected, and the company aims to start trial production of Micro-LED displays in the second half of 2017 - it's great to see the company progressing as planned. PlayNitride says that it achieved mass transfer and placement yield rates of over 99% in its lab. In April 2017 it was rumored that Samsung Display is set to acquire PlayNitride for around $150 million, but the deal did not materialize. According to a new report from Taiwan's LEDsInside, the two companies are at the final stage of their talk. In September 2017 PlayNitride's said that Micro-LED displays are not as challenging as originally expected, and the company now aims to start trial production of Micro-LED displays by the end of 2017. The company has mass transfer and placement yield rates of over 99% in its lab.